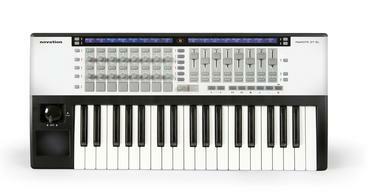 Music stores and closets alike are full of controller keyboards aimed for use with software. Most seem identical save for a set of drum pads here and a free plug-in there. The variety of options and generally low cost is great, but the keyboards themselves (you know, the black and white bits) often seem like afterthoughts. And adding and subtracting knobs and controllers seems to miss the point: What we really want isnÃƒÂ¢Ã¢â€šÂ¬™t just more or different controls, but ones that are better integrated with our favorite music software. NovationÃƒÂ¢Ã¢â€šÂ¬™s ReMote SL line aims to be different on both points, with hardware that feels like an instrument, and intelligent ÃƒÂ¢Ã¢â€šÂ¬Ã…“AutomapÃƒÂ¢Ã¢â€šÂ¬Ã‚? capabilities to save us from the drudgery of programming MIDI assignments one-by-one. So, is this finally the MIDI keyboard youÃƒÂ¢Ã¢â€šÂ¬™ll keep for years into the future? Now the good news: having worked with the Live 6 beta and my ReMote SL 37, many of these issues are — as promised — being addressed by Ableton in the upcoming release. That’s terrific news, as I think Live probably tops the list for the Automap desires of potential and current SL owners. For instance, Live can wait until you’ve moved a control past its previous position before changing the value, solving the problem of jumping faders and knobs on non-motorized control surfaces. (If that didn’t make any sense, just try it; you’ll see what I mean.) I don’t want to comment further until the finished Live 6 is out (though you can read more about this publicly on the Ableton forums, as always). But you can expect some new power tricks combining the SL and Live 6, some of which I’ll happily share soon. I don’t think you’ll ever eliminate the need for custom templates, but there are some interesting new possibilities for adding automatic mappings when they make sense. As always, let me know what you think of the review, particularly if you’ve tried an SL yourself. And I can’t overstate how much I like the feel of the keyboard itself, all this Automap aside. Even on synth action keyboards, feel makes a huge difference. Try getting hands-on time if you can if you’re considering buying a new keyboard; it’s always worth it, because these things really are personal. Note that the ReMote is also available in 25- and 61-key flavors, as well as a control surface alone. The latter I’m not as crazy about because I like the keyboard and X/Y controllers at a small price premium, but if you’re tight on space, it could be useful.